DETROIT (CNS) — The remains of Father Solanus Casey were exhumed Aug. 1 as part of the canonical process that precedes the saintly Capuchin Franciscan friar’s beatification Mass in November. The purpose of the exhumation, according to the Capuchin Province of St. Joseph and the Archdiocese of Detroit, was to both officially identify the body and to collect relics that will be used to venerate Father Casey after he is beatified Nov. 18. Detroit Archbishop Allen H. Vigneron presided over the private exhumation service, which was limited to a handful of individuals, including three medical professionals who were on hand to examine the remains and report on the condition of the body. “Presiding at the process for opening the tomb of Father Solanus and confirming the identity of his earthly remains was a time of significant personal prayer for me,” Archbishop Vigneron said afterward. “I especially give the Lord Jesus thanks for the gift of Father’s service to our community, above all to the least among us, and for his example of loving our neighbor with nothing less than the sacrificial charity of Christ himself. “This day is a clear milestone on our path to Nov. 18 and Father Solanus’ beatification at the Mass to be offered in Ford Field,” he said. The stadium in downtown Detroit will be configured to accommodate 60,000 people for the ceremony. “God is sure to give great blessings to all of us through this confirmation of Father Solanus’ holiness. For this, ‘let us thank God ahead of time,'” the archbishop said, repeating Father Casey’s oft-quoted refrain. Capuchin Franciscan Father Michael Sullivan, provincial minister for the Capuchin Province of St. Joseph, was among the few Capuchins present for the solemn occasion. The Aug. 1 ceremony marks the second time Father Casey’s body has been exhumed — the first was in 1987, when his remains were moved from the friars’ cemetery to their current resting place in the north transept of the St. Bonaventure Monastery chapel. The exhumation also took place one day after the celebration of the 60th anniversary of Father Casey’s death July 31, 1957. A priest known for his great faith, humility and compassion and for his ministry as spiritual counselor, Father Casey worked for two decades in the Harlem section of New York City. In 1924, he was transferred back to Detroit, where he joined the Capuchin order, and began working as the porter — or doorkeeper — of St. Bonaventure Monastery. He also helped establish the Capuchin Soup Kitchen in 1929 to feed the hungry during the Great Depression, a work that continues in Detroit today. He was declared venerable in 1995. Exhumation of the body of a sainthood candidate is part of the formalities of the beatification process and includes very strict guidelines, said Capuchin Franciscan Father Larry Webber, who along with Brother Richard Merling, also a Capuchin Franciscan, who has served as vice postulator of Father Casey’s sainthood cause since 2012. After permission was received from the Vatican Congregation for Saints’ Causes — as well as local civic officials — to exhume the body, the metal casket in which Father Casey was buried was raised from its resting place the evening of July 31, but remained unopened until the next morning. 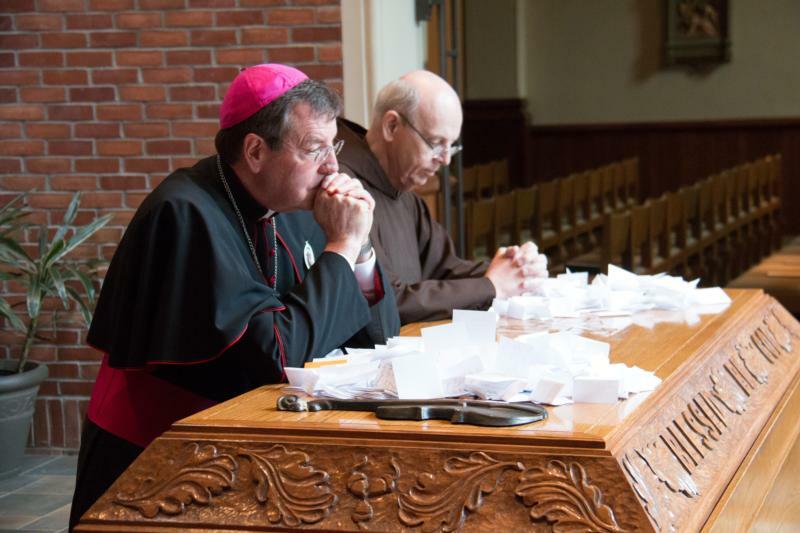 Leading a prayer, Archbishop Vigneron broke the wax seal that was left on Father Casey’s casket when it was last opened under then-Archbishop Edmund C. Szoka, and two witnesses who were present at the 1987 exhumation helped verify the body. Medical examiners were then asked to report on its condition. Church officials then oversaw the collection of first- and second-class relics — including pieces of bone, hair or clothing — which were secured inside vials to be sent to Rome, where they will be cataloged, authenticated and prepared for distribution. The body was then reinterred in a new casket, along with an authentication document signed by those present, before Archbishop Vigneron led a closing prayer. Father Webber called it a “very powerful spiritual experience” to be able to see and venerate the remains of Father Casey. Stechschulte is managing editor of The Michigan Catholic, newspaper of the Archdiocese of Detroit.